I take the necessary measures such as thorough maintenance, employee education of maintenance, the regime of the security system that the evil hotel keeps the personal information of the visitor the correct and latest state and prevents unjust access, loss, damage, manipulation, leak to personal information and I carry out safety measures and perform severe management of the personal information. I use the personal information that I took from a use purpose visitor of the personal information for the sending of an E-mail and the document as an answer to guidance of communication and the duties from an evil hotel and question. The evil hotel does not disclose personal information to a third party unless I manage the personal information that I took than a visitor appropriately and correspond to any of the following. The evil hotel takes perfect measures against security for accurate and safe securing of personal information. When inquiry, a correction, deletion of the personal information of the person is hoped for, the inquiry visitor of the person, please let it support after confirmation to be the person. The evil hotel observes Japanese laws and ordinances applied about personal information to hold it, other models and reviews contents of this policy appropriately and acts for the improvement. 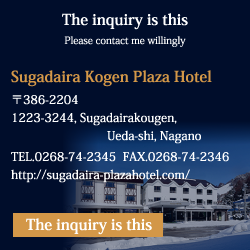 Please inform it of the inquiry about the handling of the personal information of the evil hotel at the following. ©2016 菅平高原プラザホテル. All Rights Reserved.